This gallery is being assembled as a helpful educational experience for anyone interested in the history of the old Finntown neighborhood of Minneapolis. Photo credit 1 of 2 :: K. Marianne Wargelin, 'Hennepin History Magazine', Fall 1988 issue, article: "Finntown, Minneapolis - An American Neighborhood". 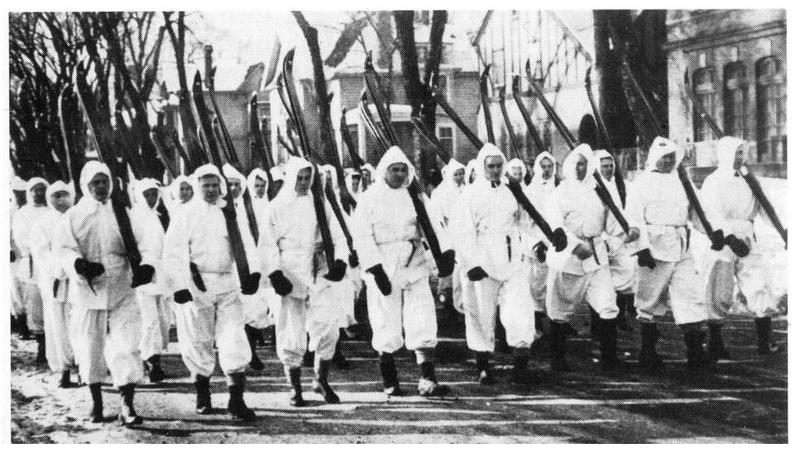 - - - Caption in magazine: ""Second-generation Finnish Americans from Finntown marching in the 1940 St. Paul Winter Carnival parade dressed like Finnish soldiers to raise American consciousness of Finland's war with the Soviet Union."" Photo Credit 2 of 2 :: Minneapolis Star, March 22, 1972, Variety Section :: Published with article ""Finntown Fading, but society grows"" - - - Photo caption :: ""Twin Cities Finns Marched In 1940 Winter Carnival Parade""
The quarrels were just as severe at the Finnish Workers' Society Hall. After World War I, the Finnish Socialist Federation splintered, one group advocating the labor-union approach of the IWW, the other group split between those who advocated the political approach of the Socialist Party and those who advocated that of the American Communist Party. Those who promoted the new Communist Party dominated, and the rest left. Some just resigned themselves, taking their social activities over to Wells Memorial Settlement House and their political activities over to the Socialist Party offices. Many were bitter. One woman who had been active in the Workers Hall theater refused to walk by the Hall, choosing instead to cross over to the other side of the street. By 1928, those who stayed in the Hall were fighting among themselves once again. This time, the dispute centered on the Communist Party directive to absorb the Finn Hall into the American Communist Party structure. When the quarrel finally abated, only a scattered remnant of the once-large group remained. In 1935, they failed to make the last mortgage payment on the largest building the Finns had built in Finntown. The rest of the community were so unsympathetic that in spite of the loss of such an important architectural achievement, they refused to bail the radicals out. The building went to creditors and ultimately was torn down. Those who were thrown out of the hall tried to reorganize. On March 19, 1930, a new Minneapolis Finnish Workers Society was formed with 50 members. They affiliated with both Finnish Americans and American IWW activities. In order to spread their message, they reinstituted cultural activities. For example, they organized a mixed chorus under the leadership of John Pietarila and later under Irene Halonen. But the times were different and the leaders were older and the Minneapolis Finnish Workers Society dissolved into non-political activity within the Finnish American Society formed after 1941. Such a story of bitterness and strife among the residents of Finntown would suggest that Finntown had burned itself out by the mid-1930s. But two events brought it back to life. The first was the Delaware Tercentenary in 1938; the second was the American response to Finland's Winter War in 1939-40. The events were so powerful that they kept Finntown going until the late 1950s, long after the Finns had started moving to Golden Valley, Hopkins and Plymouth. The Tercentenary brought Finns together in a display of ethnic solidarity unlike any seen since 1925 when Paavo Nurmi came to town. Again, an event that permitted an acceptable display of ethnicity elicited the spirit. "That's when we were united!" many older Finntown residents say. After all, Finns could claim they weren't just "dumb Finlanders," working "grunts" recently come from Finland. They were descendants of the original settlers of colonial America; one of their own, John Morton, had signed the Declaration of Independence. That summer, they held a large "kesajuhla" (summer festival) in Glenwood Park and created a large mass choir for the occasion. Hundreds of people participated. Food was served under large tents; many gallons of Finnish egg coffee were drunk; many fine greetings and speeches were given by American political leaders and Finns alike; and a play was performed based on characters like those in Kalevala (the Finnish national epic) - except that they lived in colonial Delaware rather than medieval Finland. The celebration turned out to be the preliminary to an even more important event the following year. When Russia attacked Finland November 30, 1939, Finnish Americans across the nation came to life. In Minneapolis, Finntown telephones buzzed. Handmade signs saying "Help Finland" appeared overnight on front lawns. Using the same unified approach as during the Tercentenary, Finntown residents turned their concern for their kinsmen in Finland into concrete help. On the night of the invasion, at the home of Gus and Laura Benrick, they officially organized, electing Dr. Vaino Luttio, president; Heide Robinson Eldred, secretary; Carl E. Sodergren, treasurer. Over 300 Finnish Americans met regularly at Wells Memorial, at first to plan fundraisers and later to hear reports. Everyone joined in: old and young, the Laestadians, the other Lutherans, and the Socialists (except for a core of radical Finns committed to the Communist Party). "It was the first time I was proud to be a Finn," says one man of that time. "I wasn't ashamed now to admit I was Finnish." Carrying a large "Help Finland" sign, he marched at the front of a group of men carrying wooden skis across their shoulders and wearing white uniforms to evoke the Finnish soldier fighting in the Winter War. This demonstration, part of the 1940 St. Paul Winter Carnival parade, was one of the first of many events in which Finnish Americans told the world who they were.